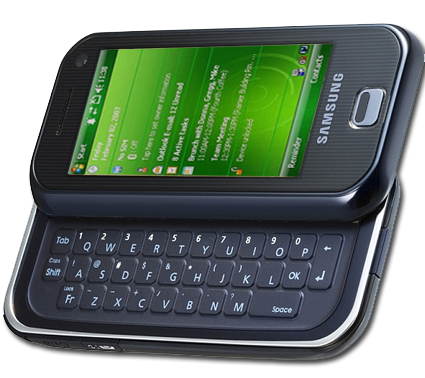 The world’s leading maker of mobile phone, Samsung has announced its new smartphone called Samsung Louvre B7610, which come with full slide-out QWERTY keyboard, 3.5 inch AMOLED WVGA touchscreen display, 5 megapixel camera with image stabilization, GPS, Wi-Fi, HSDPA, accelerometer, 1GB internal memory, and microSD expansion slot. The Samsung Louvre B7610 will be equipped with some sort of skin that will lay over top of the Windows Mobile core which give users a much more aesthetically-pleasing interface. In addition, this new smartphone will run on Windows Mobile 6.1 Professional and it will possibly be upgradeable to Windows Mobile 6.5. 1GB built in memory can expendable to 32GB using MicroSD. The new Samsung Louvre B7610 measures just 11.2 x 5.8 x 1.6 cm. This new Samsung Louvre B7610 smartphone will be available starting July 2009 through Orange Business and SFR Business Team for price between €250 and €500.